Dogs are born with a nose for odors. They love to search and locate animals, objects, individuals and other fun smelly stuff by using their nose. Depending on the breed of dog, its sense of smell is estimated to be between 1,000 and 10,000,000 times more sensitive than a human’s. Wow! Mankind has been utilizing the dog’s amazing scenting abilities in countless ways for centuries. 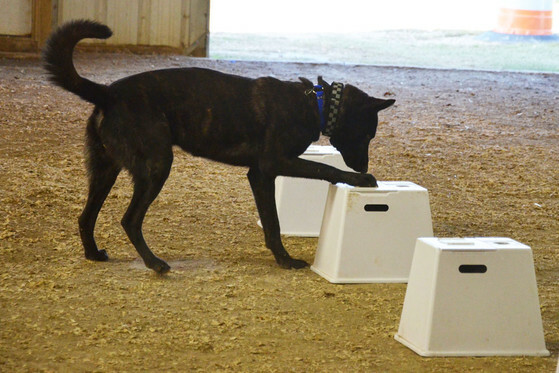 Most are familiar with the ability of a dog to use its nose to track a person’s movement over ground or through water. Hunting dogs are used to track and locate prey, while cadaver dogs specialize in locating the remains of deceased individuals. Dogs have been trained to locate oil and gas leaks for utility companies, while mineral corporations have also used dogs to locate zinc, lead and copper underground. Exterminator companies utilize dogs to locate all sorts of critters from rats in a barn to termites and bed bugs. Dogs are used by customs officials to discover fruit located in travelers’ bags and law enforcement uses the dog to detect narcotics. Explosive detection dogs are employed by the military, police and private security companies. The dog's heightened sense of smell is even being used to detect a growth of cancerous cells or an oncoming seizure, as well as signal low or high blood sugar levels. Nosework sports showcasing the dog's amazing sense of smell and their natural desire to hunt have recently been developed. 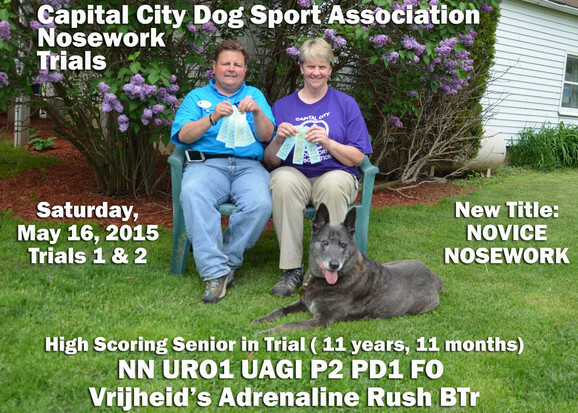 The United Kennel Club expanded our UKC Dog Events licensing to include UKC Nosework as of May 2014, with official written notification made on August 1, 2014. 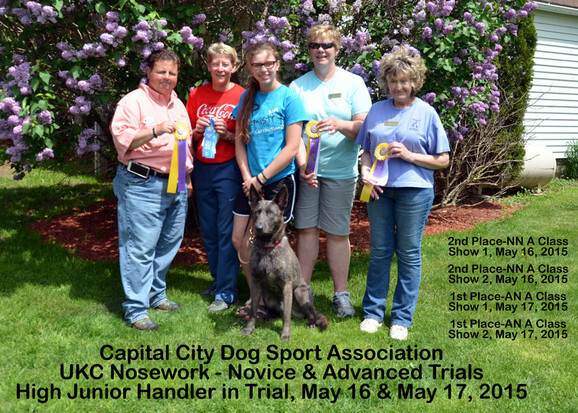 Our CCDSA membership includes 5 Nosework judges licensed by the United Kennel Club (3 Certifying Officials and 2 Hide Officials). 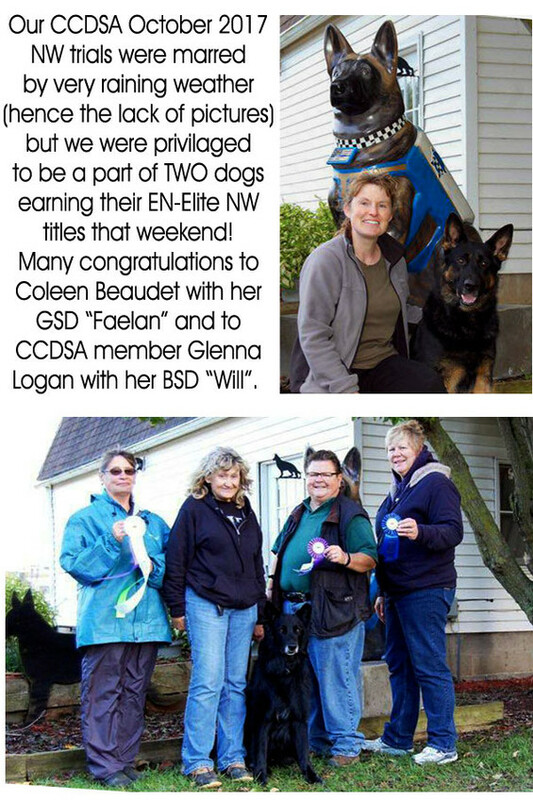 In addition, the UKC offers 3 levels of handler discrimination nosework titles (NHD-Novice Handler Discrimination, AHD-Advanced Handler Discrimination, EHD-Excellent Handler Discrimination) which requires the dog to find an article containing the owner/handler’s scent in 3 separate trials at each difficulty level. Pre-Entries ONLY; NO Day of Show entries. Check-In from 8:30-9:00am. Trial start time 9:00 am. From east or west: I96 to Grand River - exit east to first light at Frances Rd - turn left (north) for 13 miles to Centerline Rd - turn right (east) 1.7 miles to S. Lowell Road - turn left (north). Kennel is 0.7 miles north on right. From north or south: US 127 north to Price Rd - exit west for 6.6 miles to S. Lowell Rd - turn right (north). Kennel is 1.6 miles north on right. 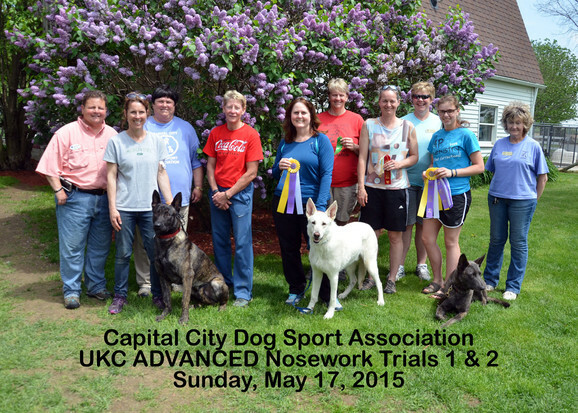 Capital City Dog Sport Association hosted 4 UKC Nosework trials over the weekend of May 16 & May 17, 2015 at Cher Car Kennels in St. Johns, Michigan. Our trials were FULL trials, meaning all 4 elements (containers, interiors, exteriors and vehicles) were offered on the same day. Saturday's trial was at the Novice level (birch), and we had 18 dogs entered in Show 1 and 19 dogs in Show 2. Sunday's trial was a the Advanced level (anise) and there were 12 dogs entered in trial 1 and 6 dogs in Show 2. Everyone had a wonderfully "good smelling" time! Below are some pictures of our competitors. 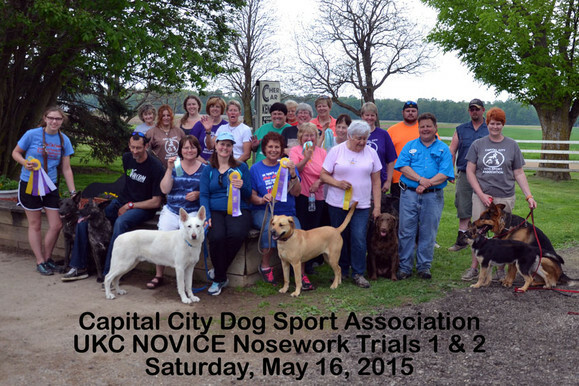 Capital City Dog Sport Association hosted four United Nosework Association trials on Saturday, May 31 and Sunday, June 1, 2014 at Cher Car Kennels in St. Johns, Michigan. We had a total of 48 dogs entered, with 34 attempting and earning their PT1. 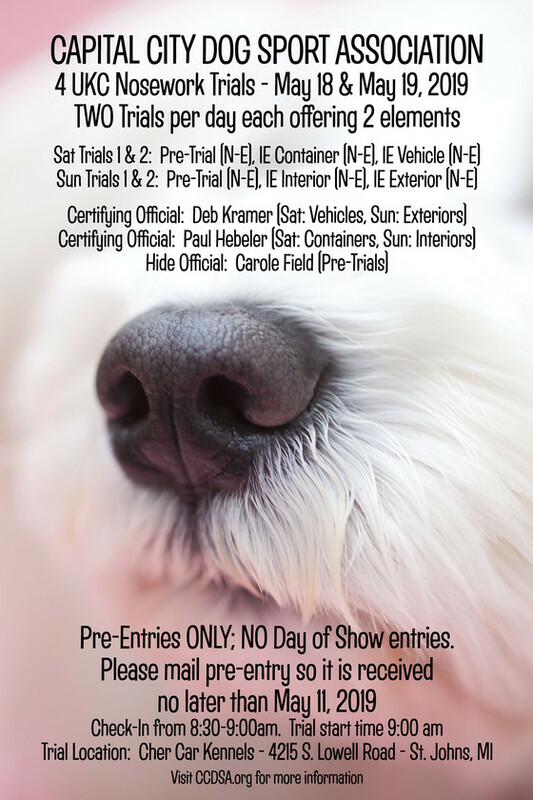 Saturday’s 2 trials saw 32 dogs earn 24 Novice Container titles, and Sunday’s 2 trials had 31 dogs earn 22 Novice Interior titles. Our competitors were a wonderful mix of dog breeds; with 11 Dutch Shepherds, 7 German Shepherds, 4 Belgian Shepherds, 4 American Mixed Breeds, 2 American Pit Bull Terriers, 2 Australian Shepherds, 2 Bernese Mountain Dogs, 2 Labrador Retrievers, 2 Rat Terriers, 2 White German Shepherds, 1 Australian Cattle Dog, 1 Alaskan Malamute, 1 Border Collie, 1 Brittany Spaniel, 1 Cane Corso Italiano, 1 Colored Bull Terrier, 1 English Shepherd, 1 Flat Coated Retriever, 1 Newfoundland and 1 Wirehaired Visla. Many thanks to all the wonderful competitors who joined us over the weekend; our CCDSA members enjoyed hosting and trialing with you all and we look forward to doing it again in 2015! 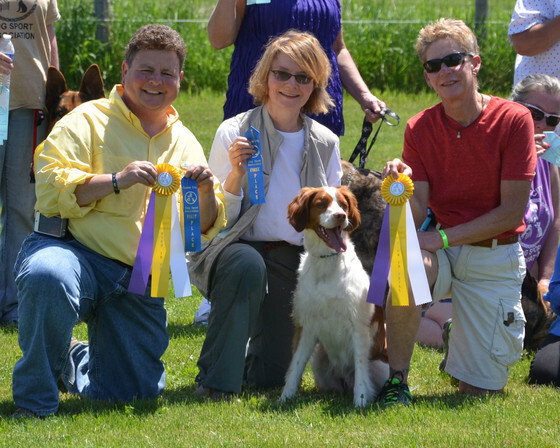 High-In-Trial for both Trial 1 & 2 on Saturday, May 31st was Brittany Spaniel "True's Sam I Am" owner/handled by Mercedes True and pictured with Judge Cheryl Carlson (on left) and Judge Linda Ringle (on right). 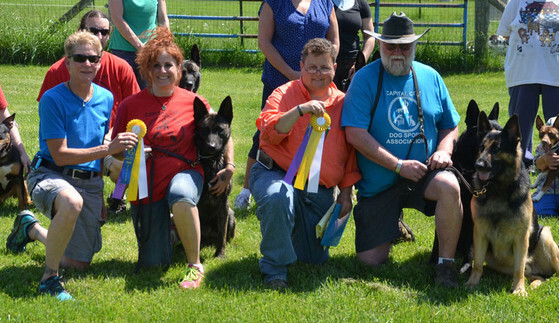 High-In-Trial on Sunday, June 1, 2014 Trial 1 was Dutch Shepherd "Cher Car's Django Unchained" owner/handled by Kristen Vaccariello (on left with Judge Linda Ringle). High-In-Trial for Trial 2 was German Shepherd "Cher Car's Cut To The Chase" owner/handled by Paul Hebeler (on right with Judge Cheryl Carlson).